At Nemco we endeavour to remain ahead of the curve in the oil and lubricant industry. The latest development is “LSPI”. Clint Domansky, Nemco’s Technical Sales Advisor, has done an excellent job demystifying Low Speed Pre-Ignition, or LSPI for short and what Nemco is doing today to prevent this issue from affecting your vehicle down the road. Low Speed Pre-Ignition, or “LSPI” is a term that refers to a developing operation and maintenance issue in many modern automotive engines. The demand for improved fuel economy and reduced emissions has driven passenger car manufacturers to design downsized, turbocharged engines. While these engines provide higher power density and improved efficiency, they are also prone to LSPI. LSPI is a premature combustion event, occurring prior to spark ignition in turbocharged, downsized gasoline vehicles. As the name implies, LSPI occurs when engines operate at low speeds and high loads, and can result in extremely high cylinder-pressures and lead to heavy knock. At a minimum, LSPI can generate an audible knocking noise noticeable to the driver. Repeated exposure to these conditions can cause engine hardware failure, including broken spark plugs and cracked pistons. Many factors have been demonstrated to impact LSPI, including: engine designs, fuel composition, and lubricant composition. On the lubricant side, the most noticeable impact has been from the detergent chemistry. Oils with higher concentrations of calcium, found in many detergent systems, have been shown to increase the frequency of LSPI. The exact chemistry of the detergent is less important to LSPI than the calcium content. Conversely, magnesium-based detergents do not seem to promote LSPI. Aside from the detergent system in the lubricant, there are many other additive and lubricant compositions that can influence LSPI. Molybdenum compounds, for example, not only provide frictional benefits, but also have been shown to decrease LSPI when used at high levels. Base oils also affect LSPI events. Both the quality of the base stock (i.e. Group II versus Group III) and the viscosity can have secondary effects on LSPI. The effect on LSPI from these other lubricant aspects are not as significant as the detergent system, but can shift the LSPI frequency in oils that are more prone to LSPI. New and upcoming engine oil specifications include LSPI prevention. The ILSAC GF-5 oil specification was established in October, 2010. The proposed ILSAC GF-6 is under development and is expected to include a Ford engine test to discriminate oils based on LSPI event prevention (reduction). Thus, all oils that will make GF-6 claims will need to be formulated to address LSPI. GM’s dexos1™ specification now includes a GM stochastic pre-ignition test. In addition to the development of the ILSAC GF-6 oil specification, in mid-January 2018, the American Petroleum Institute (API) adopted plans to establish “SN Plus”, a new interim category intended to tide over automakers until the much-delayed GF-6 oil specification can be implemented. 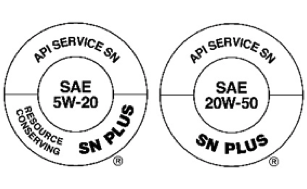 The new “SN Plus” category will only be displayed in API donut symbols. The date for first licensing of SN Plus oils has not been announced. The Nemco lineup of gasoline automotive engine oils are formulated to meet and exceed the latest API SN and ILSAC GF-5 oil specifications, and Nemco Syn-extreme oils are also licensed and approved in the GM dexos1™ oil certification program. Nemco will continue to develop oil formulations that meet the latest industry and OEM specifications, including ILSACGF-6 and API SN Plus, where licensed oils will have the formulation and properties required to combat LSPI.